In stock -This product will ship today if ordered within the next 28 minutes. 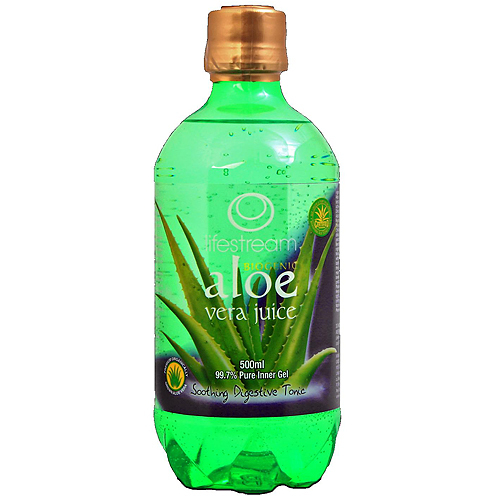 Lifestream`s pure, fresh-squeezed Aloe Vera juice is made from freshly-cut and hand-squeezed Aloe Vera leaves, and prepared from the pure inner gel of mature Aloe Vera plants, at the peak of their biogenic potency. LifeStream Aloe Vera Juice contains numerous essential minerals, enzymes, vitamins, proteins, amino acids plus many other active components such as saponins and polysaccharides - essential for cell growth and renewal. It is widely regarded as an excellent product for supporting and maintaining digestive health. Why LifeStream Biogenic Aloe Vera juice? Lifestream`s juice is pure, fresh-squeezed and unmistakably `the real thing` with the full original taste, colour, smell, feel and - most importantly - biostimulating efficacy of hand-squeezed freshly cut Aloe leaves. LifeStream`s Biogenic Aloe Vera juice is prepared from the pure inner gel of mature Barbadensis Miller Aloe Vera plants, at the peak of their biogenic potency. Bottles are made from food grade PET (polyethylene tereaphthalate), recycle code 1. 99.7% pure Aloe Vera juice. Preservatives: Citric acid, potassium sorbate, sodium benzoate. Store below 4 degrees and use within 90 days of opening. 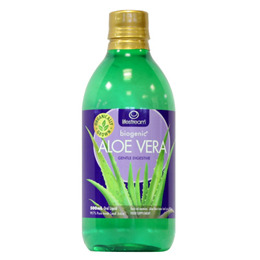 Below are reviews of Lifestream Aloe Vera Juice - 500ml by bodykind customers. If you have tried this product we'd love to hear what you think so please leave a review. Tastes ok not been taking long enough to comment on performance. Seems good quality and price ok.
Not sure if it's helping me haven't been taking it that long, think I should give it more time. But my skin seems to look a bit healthier and I haven't had any spots while taking this. I'm hoping it will give me more energy though. I also suffer from rheumatoid arthritis and I haven't noticed any improvement with pain & swelling, but I've only been taking it for 6 weeks. have been drinking this for last 7 days and my skin feels amazing. Its very refreshing and cleansing and best to drink first thing in the morning on an empty stomach. Lifestreams pure, fresh squeezed Aloe Vera juice is prepared from the pure inner gel of mature Aloe Vera plants, at the peak of their biogenic potency.